We accept tourers motorhomes and tents to which electric is available to both. 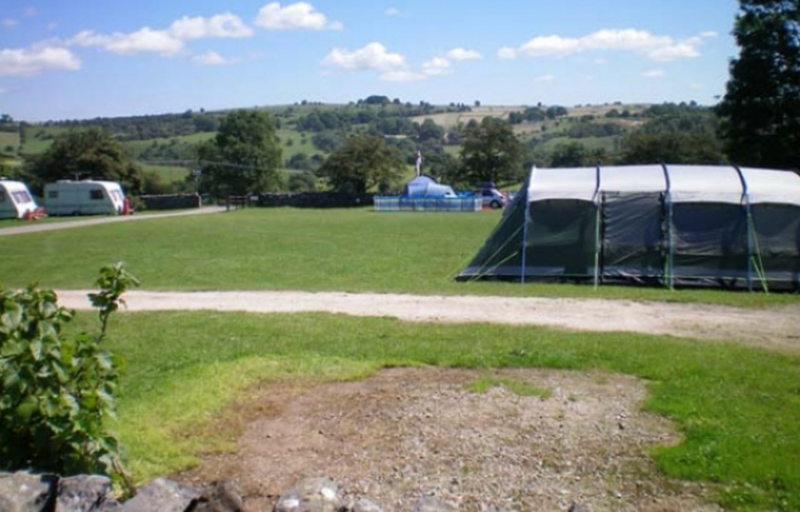 We have two large fields for camping which are open fields which do not have set pitches so you can arrive and take your pick where to pitch up. We have a separate field for electric pitches which are all on grass. We are 8 miles from the historic market town of Bakewell, where there is a market every Monday, Matlock Bath, where there is Gullivers Kingdom, and the Cable Cars at the Heights of Abraham, Buxton and Ashbourne. Dovedale, and the Tissington Trailas well as Chatswoth House and Haddon Hall, are all within a 15 minute drive, as well as fabulous walks with stunning views. We do allow dogs on our site and these are free, but we do ask that they are kept on a lead at all times as we have hens roaming about, and that they are definitely cleaned up after. You can make a booking either by phone, on 01629 650 368, we also accept cash and cheques. We have full on site facilities including toilets and shower blocks, which are charged at £1 for 5 minutes or 20p for 1 minute , pot washing areas, drinking water and an extensive play area for children which is a big hit, which you can camp right next too if you are non electric. Please note that children are your responsibility at all times. There is a small shop on site run by Dawn and Simon which sells camping equipment cold drinks ice creams and some local produce. There is a fridge freezer in both the top and bottom facilities which are available to everyone, and come in handy to keep your freezer blocks cold. All items need to be clearly marked in a bag with your name and date on, and when you leave please remove any food left in either the fridge or freezer. Any out of date food will be thrown away, and it is left entirely at the owners risk. We do hire out firepits, and do this on a first come first served basis, and have a limited number available, they are a £10 deposit and £4 per night, and can be hired from the shop during opening hours. We also provide briquettes and starter packs at our shop or you can bring your own. They must be raised off the ground so they do don't burn the grass, and also ask that you do not take stones off the walls, there are bricks available at the bin area for this use. We do not allow young groups, but we do welcome family groups, and have a strict curfew on noise after 10.30pm. We have some pigs on site which love to be stroked and fed, as well as some ponies who love attention ! Due to the limitations of BT's infrastructure we have limited internet available.